The Philadelphia Baseball Review is excited to announce Tim Brennan from Saint Joseph's University as the recipient of the 2018 Philadelphia NCAA Division 1 College Pitcher of the Year award. The junior right-hander finished the season leading all D1 Philadelphia-based pitchers in ERA (2.94), wins (9), and strikeouts (84). His 0.90 WHIP was the best mark by a starting pitcher in the city. Perhaps even more impressive than his standout ERA and strikeout total is the fact Brennan surrendered only five walks all season. A product of Holy Ghost Prep, Brennan has pieced together three outstanding seasons at Saint Joseph's and finishes his junior season with a career 2.79 ERA over 39 appearances with 37 of those as starts. "First and foremost, I want to express how fortunate we are to have Tim in our program here at St. Joe's," Hawks head coach Fritz Hamburg said in a statement. "A great deal of credit goes to Tim's mother and father and his extended family for raising him the way they have and instilling the values that he exhibits daily. He is one of the most grounded and humble young guys I have coached. "Tim's success not just this season, but his previous two is a direct result of his work ethic and commitment to excellence. He obviously has a very solid skill-set, but to his credit, he constantly works at developing and strengthening that skill-set. The other key component that Tim possesses is the "it" factor. The best players carry themselves a certain way, they believe that they are great because of how they conduct themselves, not only on the field but in life. "He prepares himself in all facets and that clearly shows up when he steps on the mound. There was no doubt that when Tim takes the mound, the team is very confident that we have a great chance to win for all of the reasons I just mentioned. That is perhaps the biggest compliment a player can receive from your teammates. To know that the team feels that strong about your preparation, ability, and competitiveness is outstanding and something he has earned. He sets a great example for his teammates and certainly the other pitchers, who are around him every day." 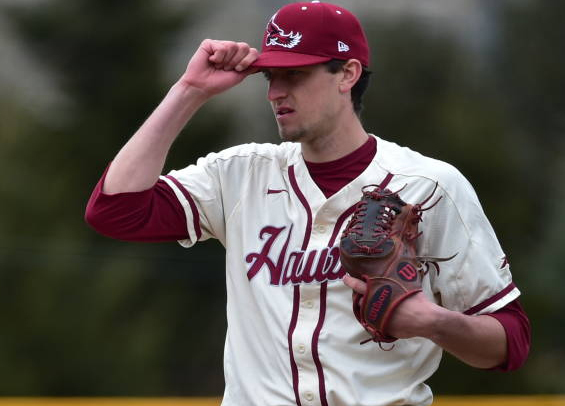 With the Major League Baseball amateur draft set to begin a week from today, it's more than probable Brennan will have an opportunity to leave Hawk Hill for the bigs. If drafted, he'll be the first Hawks' pitcher selected since Jordan Carter who was chosen by Cleveland in the 22nd round in 2014. "Whether Tim returns to SJU for his senior season or moves on after the MLB Amateur Draft next week, we all believe that Tim will continue to achieve a very high level of success in his journey through life," Hamburg said.